The fastest way to run or start the command prompt in every Windows System, is via RUN-Dialog in Windows. Please start via Keyboard-Shortcut [Windows-Logo+R] the Run Dialog and enter the Command cmd.exe or cmd and press [ENTER]! 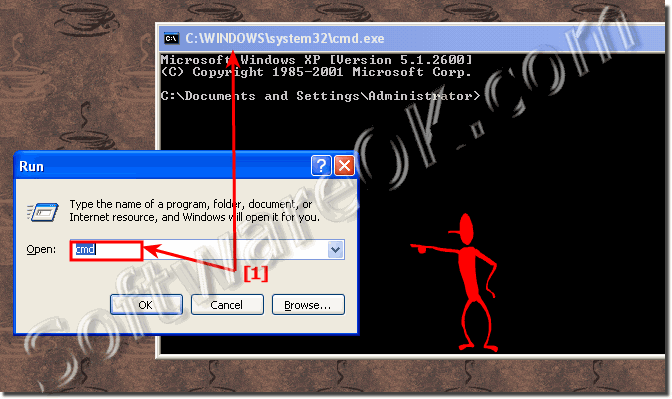 See also: ► Run command prompt (cmd.exe) in administrator mode! This example to run the Command Prompt ergo cmd.exe is suitable for most Microsoft Windows OS in example for Windows 10 (Redstone 4 & 5), 8.1, 8, 7: Pro, Home, Enterprise, Basic, Premium, Professional, Starter, Ultimate, Windows-Server 2016, 2012, 2008 and is a very useful feature. HOT TIP: Run-Command - Windows-10 alternative to standard Windows Run-Dialog! Windows-Console - FAQ-1: Fast start for cmd.exe (Windows Console)? Using SCHTASK for Programs Autostart in all Windows OS, how to?